I wasn’t sure what to expect when I visited Valparaiso (known locally as ‘Valpo’). My knowledge of the city was limited to the fact that it’s the leading port of Chile, about 120 kilometers west of Santiago, it’s on UNESCO’s World Heritage list and that it’s situated along the edges of a massive bay. Some guides even went so far as to suggest staying in neighbouring Vina del Mar (a seaside resort town) as there wasn’t much to see in Valpo. I arrived there exhausted after a gruelling nine hour bus ride from Mendoza across the Andes in Argentina. However, the fresh ocean breeze lifted my spirits and after a short stroll, I thought, this town is just absolutely gorgeous! Valpo is built on several hills that face the ocean, hugging the bay like an amphitheatre. The first thing that struck me were the colours. Valpo is one of the most colourful cities I’ve ever seen. The houses cling to the steep slopes of the hills and are painted in bright colours (in various hues of red, blue, yellow, orange and purple). In addition, many walls are adorned with fascinating murals that are a kaleidoscope of colour. During the next few days, I became increasingly fascinated by the murals. The most beautiful can be found in the Cerro Bellavista, Cerro Conception and Cerro Alegre neighbourhoods. Cerro Conception and the adjoining Cerro Alegre are simply gorgeous. The colours of the houses are just electric while the sleepy, tree-lined, cobblestone streets with their many wall murals are wonderfully atmospheric. I just loved the murals. There are a countless number of themes: socio-political, historic, sexual, scenes of Valpo, while some were just decoration. Walls are the predominant surface used but I spotted some smaller works of art on the backs of street signs, streetlights, balustrades and even ordinary rocks on the road! Cerro Bellavista is home to the open-air museum, Museo a Cielo Abierto, that houses a wonderful collection of about 20 murals painted on the façades of the buildings. It takes a decent amount of stamina to clamber up and down Valpo’s hills to explore the various neighbourhoods and discover the myriad of murals. Luckily, the city has a system of (antiquated) funicular railways which was built in the 19th century. Each ride is a fun experience! Besides, if you’re out of breath, stopping to admire one of the many murals is a wonderful excuse for a break. Search for hotels in Valparaiso. Read about Velvet Escape’s ‘Stayed There’ feature: Robinson Crusoe Inn, Valparaiso and Velvet Escape’s Culinary Journey: Café Turri, Valparaiso. Incredible photos! I can’t believe those murals. Stunning street art! Love it. Beautiful and fun photo tour. I wish these photos were a bit larger. I want to see these amazing details… since I’m not there. Great post, thanks for the share. I’ve always wanted to go to Chile and this really cements it. What fantastic pictures. I assume there’s an easier way to get there than the 9 hour bus ride? Thanks Juno. 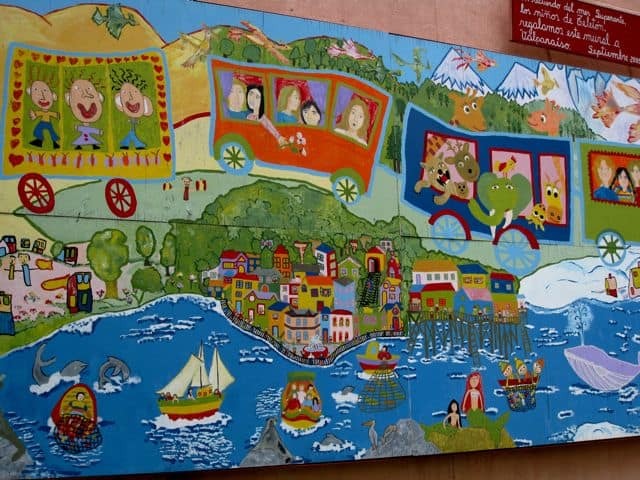 Yes, certain parts of Valparaiso are like that: many vivid murals, great views of the ocean and gorgeous, colourful houses. I absolutely loved it there. wow.. Love the color! Whole neigborhood is like that? What a view! South america is definately on my list for backpacking. Should take a note on this too! 🙂 Thanks for sharing Keith! Wow, I don’t know what to expect of Valparaiso (except that Sting sang about it), but thanks for sharing! The colours are truly electric–graffiti with a touch of south american flavah! Nice!